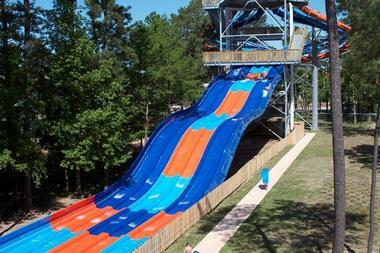 They say that everything is bigger in Texas, and many of the waterparks found here are no exception to the rule. 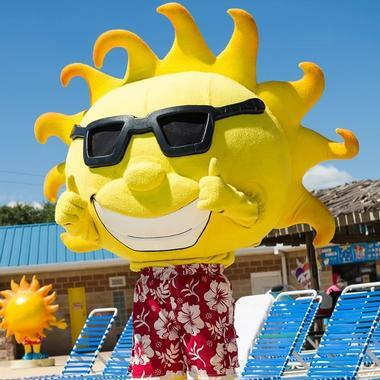 Visitors and locals alike need to escape the Texas heat, especially during the sizzling summer months, and there's no better way to do so than by spending the day cooling off at one of the state's family-friendly waterparks. There's something for everyone, whether you're interested in throwing yourself down an adrenaline-pumping freefall ride, drifting along a peaceful lazy river in an inner tube, or watching your kids splash around from the comfort of a shady cabana. Opened in 2008, the Waterpark at the Villages can be found at the Holiday Inn Club Vacations Villages Resort on the shores of Lake Palestine. The park offers 25,000 square feet of fun, including a 19,000-square-foot glass-enclosed area with a retractable roof that allows visitors to enjoy the park year round. 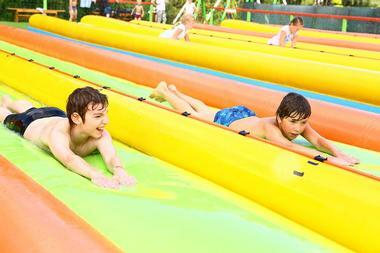 In addition to a water play area and a wave pool, the waterpark offers body slides, tube slides, and a lazy river. A variety of party packages are available for children's birthdays and other special events, and professional lifeguards are on duty in the park at all times. Offering 80,000 square feet of indoor rides, slides, and pools, Epic Waters Indoor Waterpark allows families to have fun in the water throughout the year. The outdoor wave pool is only open in the summer, but the rest of the park is located under a retractable roof. 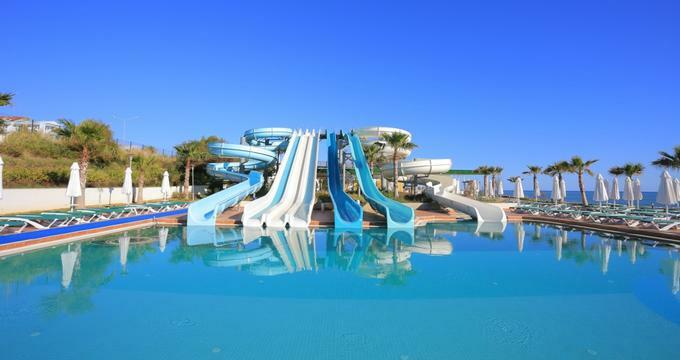 There are eleven exciting waterslides to choose from, three of which hold the honor of being the first of their kind in the world. Exclusive cabanas can be rented by groups of up to eight people, and the park also offers a gift shop, a state-of-the-art arcade, a grill, and a bar. Open only to guests of the Great Wolf Lodge, this waterpark is an 80,000-square-foot complex that caters to guests of all ages. The youngest visitors will enjoy playing in the water park tree house and splashing around in the Cub Paw Pool, while their older counterparts can keep themselves entertained with tandem tube rides and exciting body slides with multi-story drops and vortexes. Adults are welcome to join in on the fun, but they can also escape to one of the park's two hot tubs or even to the on-site resort spa for some well-deserved pampering. Lubbock Water Rampage has been open for more than 30 years, and it's still just as fun as it was when it first opened. In addition to exciting slides, the park offers a lazy river, a huge wave pool, and an interactive pirate ship with a dumping bucket. The park is a wonderful place to host children's birthday parties, especially if you manage to schedule your event on the same day as one of the monthly movie nights held in the summer. Admission is half-price every day after 4pm, and lockers and tubes are available for rent on a first-come first-served basis. Aquatica San Antonio is owned by SeaWorld, so it's the perfect choice for anyone who wants to visit both attractions. 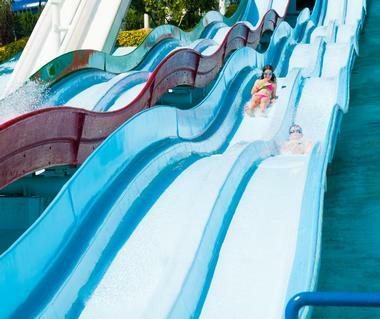 The rides range from sedate lazy rivers to thrilling waterslides, and unlike most other waterparks in the world, Aquatica has a number of rides that allows visitors to get up close and personal with animals like stingrays and tropical fish. It is possible to visit both SeaWorld and Aquatica in one day, but visitors who have a bit more time to spare would be well advised to purchase a 2-day pass that allows access to both parks. Only 10 minutes away from downtown Dallas, Bahama Beach Waterpark offers excellent value and plenty of family-friendly fun. 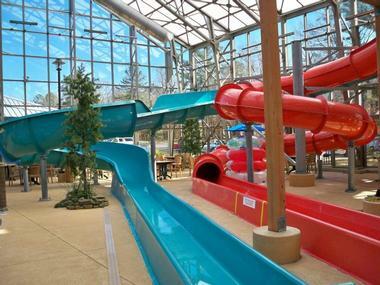 Highlights include a children's water playground with a thousand-gallon dumping bucket, several 45-foot-tall slides aimed at older children and adults, and two zero-depth entry beaches that provide access to the lazy river and are perfect for anyone who wants to paddle around in the water. Food and beverages can be purchased from the on-site eatery, and anyone who wants to stay cool without spending too much time in the water can rent one of the park's five private cabanas. Located in Wichita Falls, Castaway Cove Waterpark offers seven water attractions that are fun for the whole family. 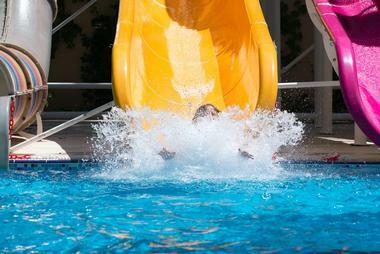 The shipwrecked-themed pools and slides range from leisurely activities like the lazy river to exciting options like the Pirate's Plunge, a slide that boasts a 37-foot vertical freefall. The park also caters to visitors interested in getting some exercise; one of the pools features water volleyball and basketball courts as well as an activities area aimed at younger children. Groups can rent out private poolside cabanas, and the park is happy to offer special packages for birthdays and other special occasions. 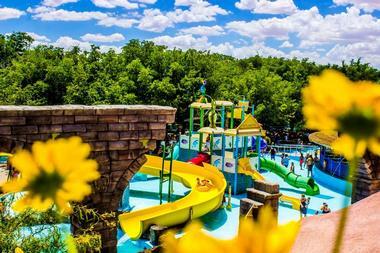 Encompassing 14 acres, Hawaiian Falls Mansfield is one of five Hawaiian Falls waterparks in Texas. There are 14 slides for visitors to choose from, including an exciting two-person halfpipe ride and a slide that promises to turn riders into human torpedoes. Plenty of more relaxing options are available as well; the younger members of your family will enjoy playing in the interactive splash park, and the lazy river is fun for people of all ages. Visitors can also browse the gift shop, enjoy a picnic or a meal from one of the on-site restaurants, or relax in the comfort of a private cabana. With seven exciting rides, an interactive treehouse attraction, a lazy river, and a family-friendly wave pool, Hawaiian Falls The Colony has something to offer everyone. Young children will love splashing around in the park's huge “rain fortress,” while older children and adults can get an adrenaline rush from rides like the 65-foot freefall body slide, the thrilling Torpedo, and a two-person inner tube ride known as the Hawaiian Halfpipe. The park also offers a special area with private cabanas; reservations must be made at least 24 hours in advance, and all cabana rentals come with unlimited drinks and an attendant. 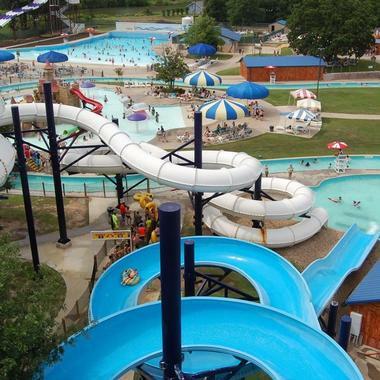 The largest of the Hawaiian Falls waterparks, Hawaiian Falls Waco sits on 10 acres of land covered with family-friendly attractions including a football-sized wave pool, a children's spray park, and a 800-foot lazy river. There are also plenty of rides to keep adrenaline-seekers entertained; the highlight is the six-story Tempest Tower, which offers a thrilling selection of freefall body and tube slides. In addition to the rides and pools, the park also offers three food outlets and a gift shop. Parking is free, and life jackets and tubes are available to guests free of charge as well. Hawaiian Falls Garland was the first Hawaiian Falls waterpark to be built, but it's anything but outdated – the company has been constantly expanding and improving the 12-acre park since it was first opened in 2002. 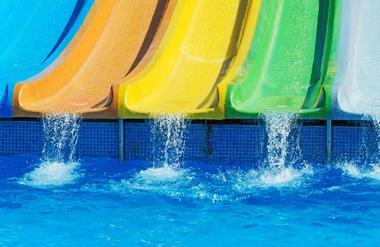 Like all of the waterparks in the Hawaiian Falls family, the Garland location offers everything from mind-blowing body and tube slides to wave and splash pools perfect for visitors of all ages. Guests are welcome to bring in their own food and beverages, but they can also enjoy a refreshing Hawaiian shaved ice or a satisfying meal from the snack shack. 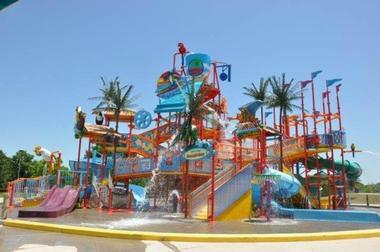 Opened in 2011, the Hawaiian Falls Roanoke is a state-of-the-art waterpark with a wide range of innovative attractions. One of the most impressive features of the park is the Mega WaterWorld attraction, a family-friendly area with slides and a raft ride that also happens to be the world's largest aquatic play structure. Outside of WaterWorld, visitors can race each other down a multi-tube slide, float past waterfalls and turtles on the lazy river, or get an adrenaline rush on the 65-foot freefall body slide. Parking is free, and guests are welcome to bring in their own coolers for a small fee. Conveniently situated between Dallas and Fort Worth, NRH2O Family Water Park is one of the state's only municipally owned waterparks. 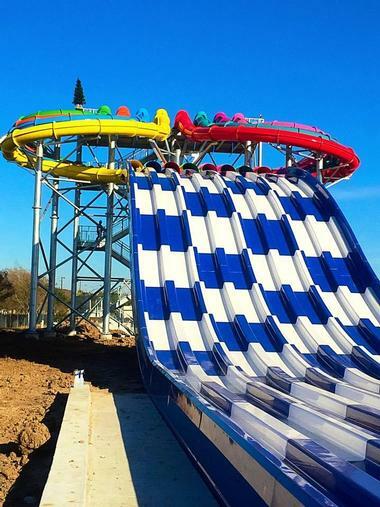 It boasts nine exciting waterslides, including a four-lane mat racer, a 330-foot-long body slide that begins with a 60-foot drop, and the world's largest uphill water coaster. In addition to the slides, the park offers a white sand beach, a large pool, a sand volleyball court, and a charging station. The park is also proud to host special events all throughout the year, including polar dips, fireworks, and pool parties for dogs and their owners. As you might have guessed from the name, Pirate's Bay Water Park is an elaborate pirate-themed waterpark complete with pirate ships, parrots, and rope ladders. The highlight of the park is an exciting surfing machine that allows children to practice riding the waves in front of an audience, but other features include two waterslide towers, a climbing wall, a lazy river, and a splash park with a pirate's head dumping bucket. Movie nights are held in the wave pool every Thursday night during the summer, and half-price admission is offered after 4pm between Monday and Thursday. 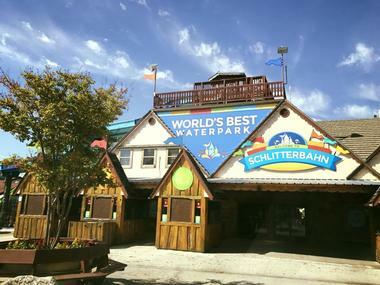 Featuring more than 50 attractions spread out over 70 acres, Schlitterbahn New Braunfels is the company's flagship location. 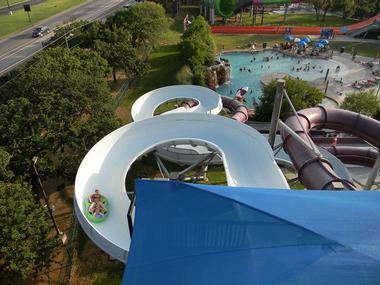 All of the pools, slides, and rides use water from the Comal River, which flows right through the center of the park and provides plenty of opportunities for tubing and swimming. The park has plenty of more adrenaline-inducing attractions as well, including an uphill water coaster, tube chutes with daring drops, and a dragon-themed slide with special effects. Shady picnic areas can be found scattered all throughout the park, and overnight accommodation is available at the on-site resort. 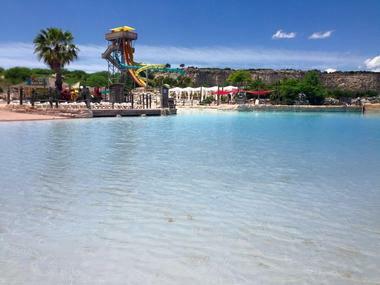 Part of the Six Flags Fiesta Texas amusement park, White Water Bay is an exciting waterpark with 15 different slides and attractions for visitors to enjoy. 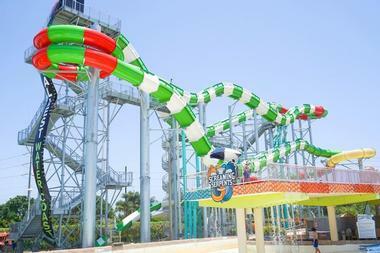 One of the major highlights in the park is a unique waterslide/roller coaster hybrid opened in 2017, but other attractions include a giant funnel tube ride, a six-lane mat racer, a Texas-shaped wave pool, and the Bahama Blaster, the steepest waterslide in the world. Entrance to the waterpark is included in the price of admission to Six Flags, and season passes are available to families interested in unlimited visits. Six Flags Hurricane Harbor is one of the waterparks owned by the Six Flags theme park company, and with 24 rides spread out over 50 acres, it's the largest waterpark in North Texas. Visitors who want to try all the slides should plan to spend more than one day here, which is easy to do if you take advantage of the park's overnight accommodation. 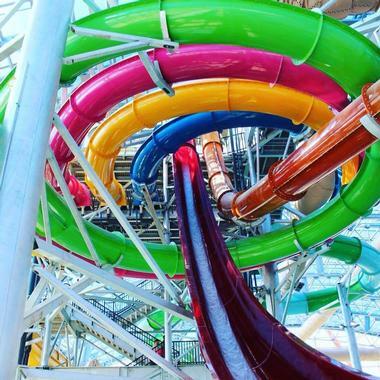 Family-friendly options include a scenic lazy river and a million-gallon wave pool, but visitors can also opt for heart-racing slides like a 72-foot freefall slide and a giant funnel raft ride. 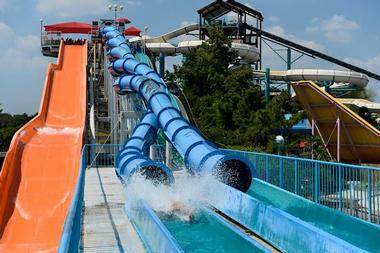 There are six Splash Kingdoms spread out across Texas, but the Splash Kingdom Canton Waterpark is the original. The wave pool and lazy river are great for anyone interested in simply cooling off and relaxing, but the park also offers a selection of excellent tube and body slides. There are plenty of things to do outside the water as well, including laser tag, mini golf, and an arcade. Free volleyballs can be borrowed at the gift shop by anyone who wants to make use of the park's sand volleyball court, and plenty of food and beverage options are available at the on-site eatery. 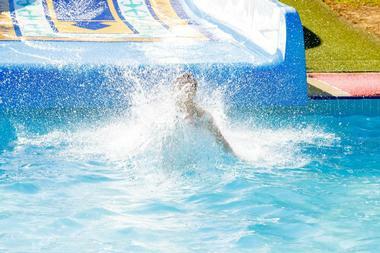 Family owned and operated, Splashway Waterpark has something to offer visitors of all ages. Young children and their parents will love the pirate-themed play structure and splash park, while the whole family can enjoy relaxing or splashing around in the wave pool. A peaceful lazy river winds its way past several of the park's attractions, but the park also offers thrilling slides with freefall drops, extreme twists and turns, and dark tunnels. Guests are welcome to bring in their own food free of charge, and the price of admission includes complimentary parking and use of the park's life jackets and inner tubes. First opened to the public in 2016, Typhoon Texas is one of the newest waterparks in the state. It also happens to be one of the largest, covering 25 acres and offering 30 waterslides, a huge wave pool, a lazy river, and an elaborate four-story children's play structure. 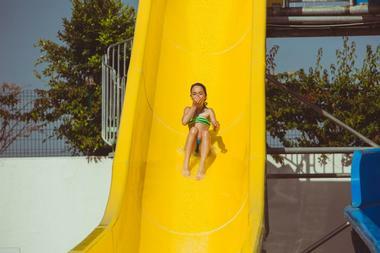 There are more than enough thrilling slides to keep your adrenaline pumping the whole time you're in the park; some of the highlights include a slide with a seven-story freefall drop, an interactive video game and waterslide combo ride, and an eight-lane tube slides that allows guests to race their friends to the bottom. 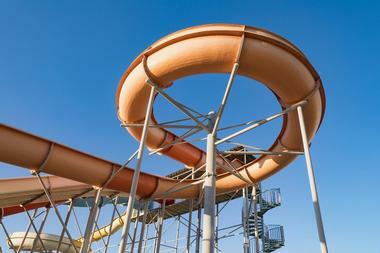 Conveniently located just north of Houston, Wet 'n' Wild SplashTown is the biggest waterpark near the city. The many rides and slides are spread out across 40 acres of land, offering something for thrill-seekers and young children alike. The giant wave pool and lazy river are fun for the whole family, but brave visitors can also try exciting rides like the Tornado, a slide that sends riders down a 132-foot-long tunnel and into a giant funnel. The on-site food outlets sell everything from hamburgers to funnel cakes, and special meal deals are available to season pass holders. 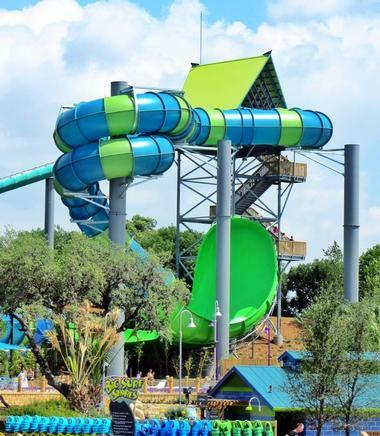 With more than 25 attractions set on a 60-acre property, Wet'n'Wild Waterworld is easily the biggest attraction in the small town of Anthony, Texas. In addition to exciting slides like the Corkscrew and the Blaster, the park offers a wave pool, a climbing wall, volleyball courts, and a children's spray park. Several different types of private cabana are available for rent, and discounted admission rates are offered for groups of 25 people or more. Festivals and concerts are sometimes held in the park during the summer, and the park is happy to help arrange birthday parties, corporate gatherings, and even overnight sleepovers.